JARED KLEIN (Technical Director / Artist-In Residence) is delighted to be returning to the Skidmore College Theater Department. Previously, Jared was the Production Manager and Technical Director for BRIC Arts Media Brooklyn, where he opened their state-of-the-art facility in the heart of downtown Brooklyn’s cultural district, and production managed the inaugural season working alongside acclaimed companies such as Tectonic Theater Project, The Debate Society, The Builders Association, and National Public Radio. Prior to that, Jared spent six years as the Technical Director and Resident Designer for the Tech and Design program at Adelphi University. Select Adelphi lighting and video design credits include: Top Dog/Under Dog, The Living Newspaper, The Laramie Project, and Rent. 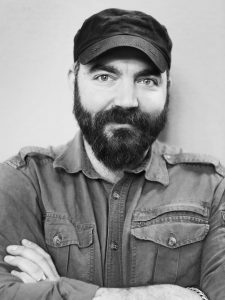 In addition to almost a decade of educational experience, Jared has fifteen plus years of professional experience as a Technical Director, Lighting / Video Designer, and Production Manager for both theatrical and industrial design companies throughout the US and Europe. He was a member and resident Lighting / Video Designer with the New York-based experimental theater company, Fovea Floods, and a founding member of the Obie awardwinning Bushwick Starr Theater in Brooklyn. International lighting design and technical direction credits include Big Art Group’s House of No More, Shelf Life and Flicker, which premiered in France, Germany, Austria, Belgium, Italy, and the UK. New York design credits include: Cassandra (Helga Davis, BRIC) Minority and Glee (Nina Winthrop & Dancers, The Flea Theater), The Resistible Rise of Arturo Ui (Fovea Floods, Ontological-Hysteric Theater), One for the Road (Fovea Floods, CSV), The Maids (Fovea Floods, Bushwick Starr), House of No More (Big Art Group, PS122) and Rue and Riding The Bull (Flux Theatre Ensemble, Theater for a New City). Center (NYU), and The New York Public Library.